I took my friend, Michelle, to Lake Tahoe for her first visit. It was a gorgeous, sunny winter day. We toured the lake area and she took pictures to share on Facebook with her friends back east. She wanted to have lunch either on the lake or with a nice lake view. I didn't know where to go since I just knew the casinos and my favorite pizza joint (Blue Dog Pizza) and so we asked a guy in a tourist shop for a suggestion. He told us to go to the Beacon at Camp Richardson. All these years that I have visited Lake Tahoe I had heard about Camp Richardson but never been there. I know it mostly as a family camp ground/resort. Considering that it's been there since the early 20th century, I'm sure the restaurant's quality has gone through different cycles of bad to mediocre to good. Happily it currently falls under 'good', or at least, it was for our visit. Most of the Yelp comments center on the Rum Runners, making it obvious that the place is a favorite for carousing during summer vacation after a day on the beach. After all, the Beacon is right on the shore, not 50 yards from the water. And although Michelle did have two of them, my concern is always the food. We both had a couple of items on the menu that we were interested in. One we shared was the short ribs done with a Korean style teriyaki and served with rice and bok choy. 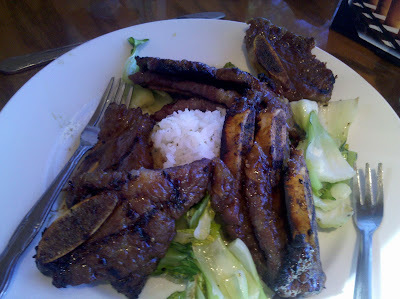 Out came out a generous plate with about 10 short rib pieces sticky with teriyaki sauce. What impressed me was that these were not skimpy, thin slices but slices about 1/3 of an inch thick. I guess I've become too accustom to the thin ones at the Hawaiian BBQ on my corner. These were meaty and tasty. The bok choy was cooked correctly with a nice soy glaze on it. 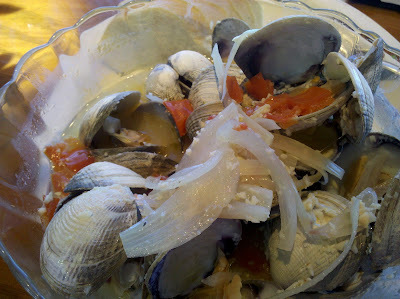 I had opted for the steamed clams in white wine garlic sauce. I got a large bowl full of sweet, baby clams. There was plenty of broth that was filled with minced garlic, sliced onion, and lots of white wine and butter. It was served with French bread fresh from the oven to sop up the abundance of broth. It was good, although a tad on the briny side. But with all that garlic, who cares? Yum. Service was a bit slow, but we were relaxing and enjoying the view anyway. In the end, we were happy with the suggestion and I'll be happy to take other virgin Tahoe visitors there again.